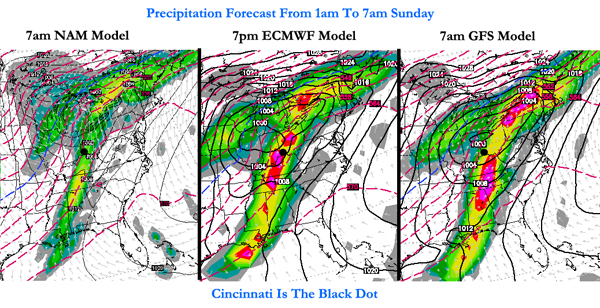 There are several things about this weekend’s weather setup that are troubling. First, waves of heavy rain are forecast this weekend, this after a couple days of snow melting to saturate the ground. 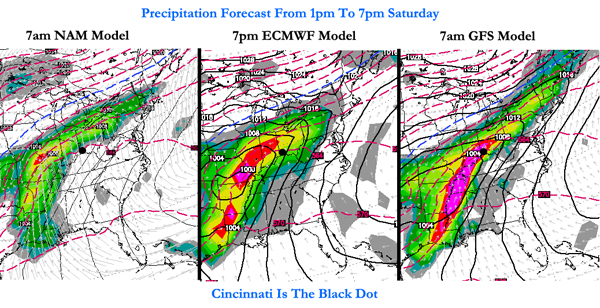 Second, there is a threat for strong and severe storms this weekend in the Ohio Valley; after a quiet spring and summer, this fall and now winter has been very stormy. 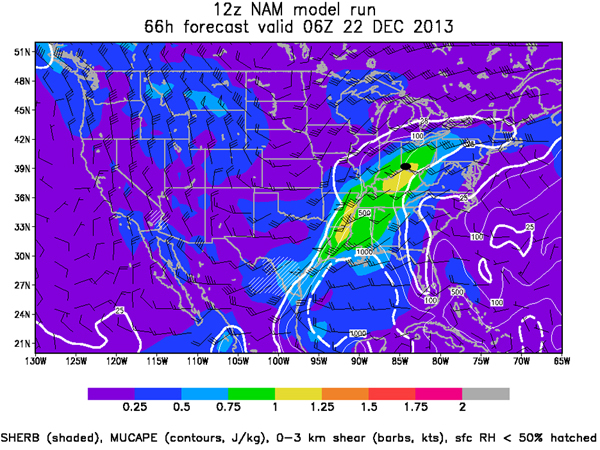 Severe weather events in the Tri-State during the month of December are very rare. 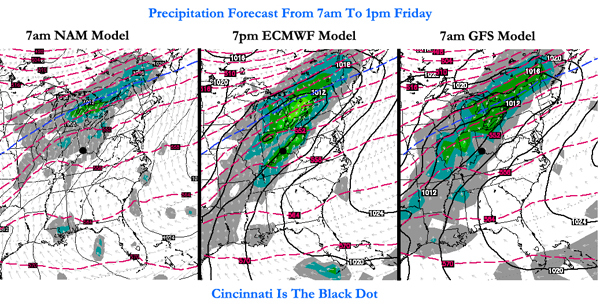 Several disturbances will affect the Ohio Valley Friday through Sunday; the thinking on the strength and timing of each has not really changed in the last 24 hours. Given the dewpoints in the 50s and 60s, temperatures in the 50s and 60s, the positioning of the jet stream, and modest instability, thunderstorms are forecast from Saturday afternoon through Sunday. In addition to the threat of thunderstorms, there is also support for strong and severe storms in the Tri-State Saturday night and early Sunday. Being south of the warm front and east of the cold front puts us in the “warm sector,” or the warm, moisture-rich airmass that will support storms. 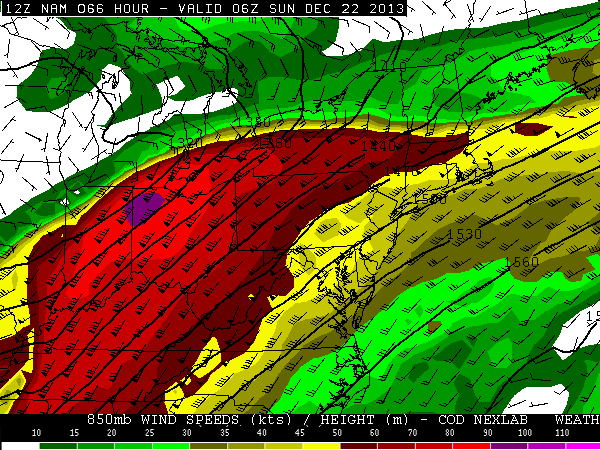 Specifically, there is a concern for damaging straight-line winds early Sunday morning. This fast moving zone of winds just above the ground is called the low-level jet. It typically strengthens before and during severe weather events, but these speeds are abnormally strong for late December. Mathematically speaking, these wind speeds are 3-5 standard deviations above average for this time of the year. Simply put, these wind speeds are rare to very rare for December. Winds 5,000 feet above the ground are often transferred to the ground – in part or whole – when heavy rain is falling. With moderate to heavy rain forecast as these winds are coming through, there is a concern for severe winds Saturday night and early Sunday morning. While instability can often have a big influence on the chance for thunderstorms, it isn’t as important this time of the year. If thunderstorms are likely (which they are Saturday night and Sunday), the SHERB parameter or index can be very helpful to a meteorologist in the colder months when looking a threat for severe weather. The SHERB parameter is helpful for getting a handle on a severe weather threat in the colder months because it focuses on temperature changes near the ground, lift in the atmosphere, and wind shear instead of instability (instability tends to be low in the winter even when we get severe weather). SHERB tells us that instability isn’t really necessarily to get rough storms Saturday night and early Sunday. Any instability will only aggravate the atmosphere more than it is already primed. A Flood WATCH is likely coming for most if not all of the Tri-State later today. It will likely be in effect most if not all of Saturday and Sunday. The GFS is clearly overdone, but 1-3″+ of rainfall is likely Friday, Saturday, and Sunday. Be prepared for flooding and storms this weekend!